There are many perspectives on spirituality and consumerism and I do not claim to be an expert on any of them. All I know (and can know) is what I love to read, use and experience that helps me live a more rich and full life. And so often anything that we find useful, supportive and even inspirational is something that others will too. And so I hope that these lovely products and a magazine I am sharing with you today (which I am seeing as my current soulful spirit seeker tools!) sparks something within you. And for your chance to win a Sacred Self Alive Alchemical You self-coaching guide with alchemical oils worth $244 AUD please read on! I have loved the products and work of Michelle Marie McGrath from Sacred Self for many years now. She infuses everything she does with incredible intention and love. And so I was not so secretly thrilled when she sent me her Alive Alchemical You self-coaching series to try which includes six of her stunning oils. The experience of using and unfolding through Alive Alchemical You is unlike anything I’ve ever done. The oils come with a beautifully designed pdf guide which acts as a self-coaching journal. There are a number of Sacred Self Alchemical ranges but this one had a focus on creative expression, radiance and inspiration. It was the absolute perfect thing for me to do while birthing this new website and in fact – I’m sure it’s responsible for much of the creativity behind it! If you would like to win an Alive Alchemical You package for yourself please keep reading! As soon as I saw the beautiful Jasmine sharing images of these candles on the Lemon Canary instagram account I knew I had to have them. (Don’t you just love/hate instagram for that?!) 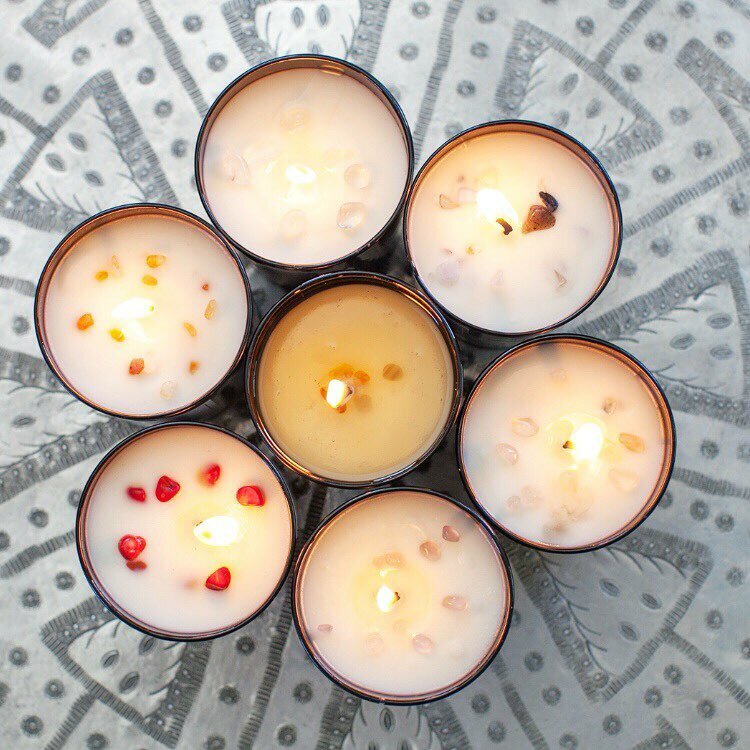 I have been a fan of Lemon Canary candles and products for years now but I knew there was something very special about these chakra candles and I wasn’t wrong. While you can choose to purchase them in a black votive I chose to get them in Moroccan tea glasses in chakra colours. They smell, feel and look divine. And also (wait for it) each candle has tiny charge floating crystals in it. Absolutely magic. I have found them so beautiful to meditate with and also find myself turning to them when wanting to create more moments of spaciousness and quiet in my day. I was captivated by the idea of this water bottle when I first saw it in a giveaway by my beautiful friends from Earth Academy. A water bottle with a crystal base that infuses the water within? Well I had to see that and experience that! So I ordered a silver bottle from Love and Lumiere and from the first sip I took the bottle has barely left my side. 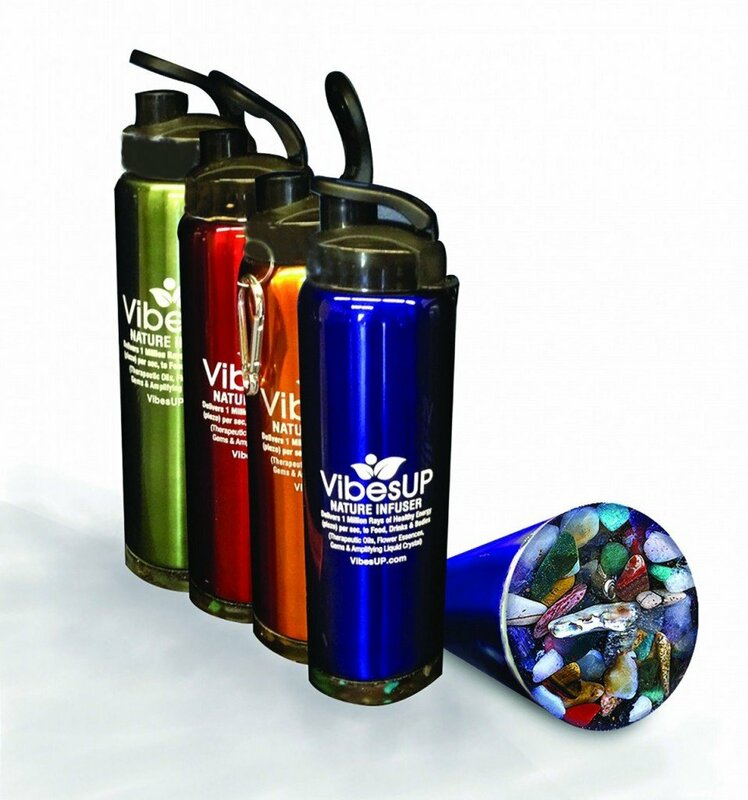 It’s easy to hold and carry, has a really nice spout to drink from and keeps your water cold for hours. And above all I could undoubtedly taste a beautiful flavour to the water for at least the first 2-3 weeks of using it. I’m not sure whether I was supposed to – but I certainly loved it. It had a slightly floral essence like taste which was so lovely and while that has faded now that I’ve refilled the bottle many times over, I still love how the base of the bottle is constantly charging the water. I’ve already bought one in blue for my stepdaughter who eyed it off pretty quickly and love that they come in such beautiful colours too. I cannot recall how I first came across this online magazine but I am in awe of Elle ….. the editor and her team for the sheer volume of content they are putting out every single week. As the editor of a inspired COACH magazine myself I know how much hard work goes into the creation of one and Over the Moon is a must read if you are at all interested in the Divine Feminine, lunar cycles, the Goddess within all of us, spirituality and living a more sacred life. The images are lush, the writing revealing, and while I don’t find all articles relevant to me every week, I never fail to find something I read from start to finish with great joy. I highly recommend. 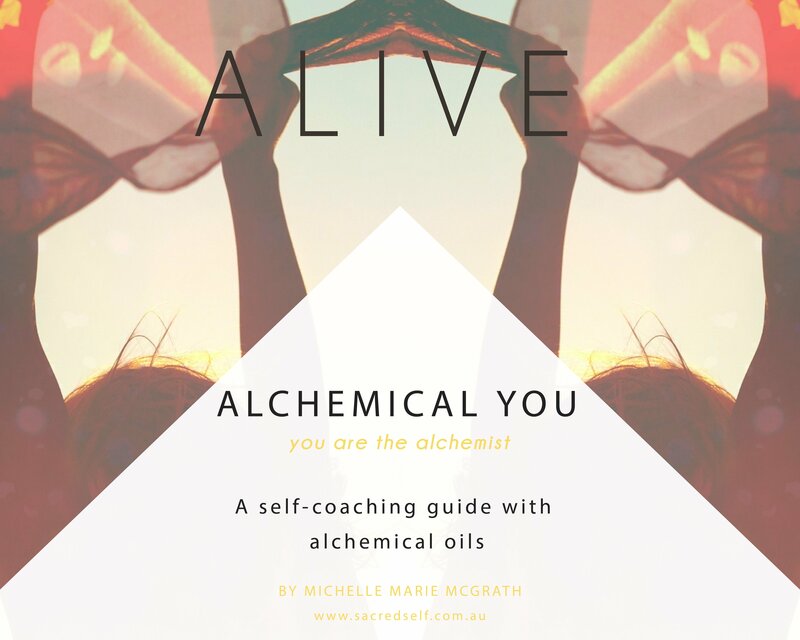 If you would like to win an Alive Alchemical You Package which includes six alchemical oils and a self-coaching guide and journal from Sacred Self worth $244 AUD then please leave me a comment below sharing with me what makes you feel most alive by April 7th 2016. I can’t wait to hear! The giveaway is open worldwide and the winner will be announced in a comment here and then emailed. I look forward to bringing you more spirit seeker tools I am loving right now as they cross my path – in divine time of course! And if you know of something that you feel I should totally have in my spirit kit then please let me know! Drop me a line or connect on any of my social media platforms. I always love hearing about beautiful new things. Hello Julie, Thanks for this lovely blog!! What makes me feel most alive is lying on the grass in my backyard surrounded by my garden with the sun shining and my cats also lolling around next to me. Barefoot Bliss! Julie what a lovely list. Elle was the first experience I had with a coach and she was the catalyst for me choosing coaching as a career. She is just a darling and I find it a privilege and a honour to write for the magazine too. It is just a gorgeous mag with such beautiful intentions. What makes me feel most alive at the moment is finally figuring out my coaching niche. Since discovering that everything has been flowing not just in biz but in general life. I’ve started to attract the right types of clients with this niche now too. I love seeing them flourish. What makes me feel most alive though in life is spending time with my husband and Flynn. Especially when Flynn giggles. There’s just something purely divine about baby giggles. How lovely Diana that Elle was your first coach and you’ve now gone on to become such an amazing one yourself. Such a lovely beginning. How beautiful Julie. Nature is what always makes me feel the most alive, there’s truly nothing like it along with soulful love filled connections. Great article and great products! I love the work you are doing. I have been thinking deeply about what makes me feel most alive and I think it has to be this – I feel most alive when I am surrounded by like-minded people, people with whom I have a real, authentic connection, people who laugh, are inspiring and motivating. I feel most alive when I’m part of life completely, laughing and relaxed and being fully totally me, accepted just as I am. Oh Julie… Your generosity has no limits. Of course I would love to win this pack!! What currently is making me feel incredibly alive are my tantric healing sessions with the amazing Chantelle Dakini here in Perth. The stuff she brings up blows my mind. When she’s not available, a dive into the cool ocean off the back of the boat is sure to awaken me. I feel most alive when I am doing something for ME! This has been a challenge all my life as I have always served others and put myself last. The universe has given me too many synchronicities lately that I couldn’t ignore and something needed to change. I have realised that a tremendous amount of healing takes place when the GUILT is released in taking time out for yourself. Me time ( mum’s time-out ) has reconnected me with my soul by allowing time to experience life’s simple luxuries like welcoming a sunrise on an early morning walk, meditating under a full moon, taking photos of majestic rainbows or simply drinking cups of tea and watching movies all day ( without feeling guilty ). I now see people smiling because of me, I see more joy in the world and I see a wonderful future ahead! My heart is now full of love, gratitude and I feel like Im glowing from the inside out! It’s simply amazing!THIS IS MY FEELING OF BEING ALIVE ! What a beautiful list Julie! I’m really enjoying this space. The thing that makes me feel most alive is being in the sea. There’s nothing like it, all my senses come to life and I feel immersed in Mother Nature. A day where I make the most of everything around me makes me feel most alive! A beautiful sunrise, walk, meditation and writing in my gratitude journal and finding my mantra for the day by the beach first thing, followed by a delicious organic breakfast with friends to laugh, giggle and catch up and share hugs and happy times. If I follow this with some self love such as a massage, facial or floating I feel both relaxed, calm and energised. If I could then spend some time reading a beautiful book or magazine and then have a delicious dinner with my boyfriend chatting over our lives, hopes and dreams together with a stroll somewhere beautiful after I would be on cloud nine happy, energised and full of love. I feel most alive when I’m in the outdoors with the breeze blowing on my skin, laughing with my man. I loved reading everyone’s comments! And what great question. I felt the most alive when I lived in Italy. I was immersed in the most beautiful language with beautiful scenery. Magical. Thank for this beautiful post Julie! I feel alive when I’m doing what I love, whether it be working, studying or time with loved ones. I feel most alive when I’m outside with the fresh air on my skin and watching my dogs play & truly enjoying that very moment. I feel most alive when I’m pushing out of my comfort zone and moving to create positive change in my life!! This has been happening a lot lately as I move towards becoming a coach!! It also makes me feel alive knowing I’m on the path to make a difference to others! So fulfilling! I feel most alive when I listen to my intuition and do something for myself. It sounds so so corny, but as a mum who is slowly starting a label and supports her husband who is a builder, my needs are often met last, if at all. So when I do what my soul yearns to do, I feel passionately alive and give back to my family so much move. Very cliche I know but so true! I feel alive when I am dancing – in a class, on a night out with friends or on my own at home. It lifts my energy in a very special way. I’m just learning how important it is to regularly do the things that make me feel most alive. The things I love! Otherwise, I feel … lifeless. The biggest thing that makes me feel most alive right now is connecting in-person with like-minded women, talking all things soul, spirituality, energy, life. My spiritual practices also make me feel alive – especially doing a chakra cleanse meditation and channeling White Light, I literally feel the energy, the life pulsing through me. I’ve also begun, very recently, getting intentional about spending time in nature, in places that make me feel alive – the forest! Getting outside and in amongst the trees has been a tremendous boost these past couple of weeks, I feel enlivened and like I’m finally coming home. Thank you Julie for this lovely post. I feel most alive when I am in nature especially the ocean. There is just something magical about. It nourishes and soothes my soul. Interestingly I don’t like being in the water, I just love to sit on the sand, take in the view and feel the wind in my hair. Ah bliss. 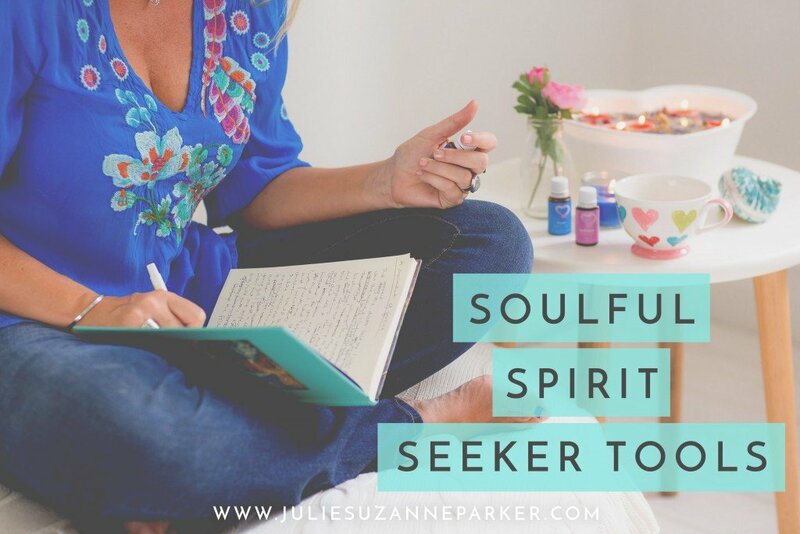 I love your ‘spirit seeker tool’ list Julie! And thank you for this beautiful giveaway! What makes me feel alive? It’s when I know I am really loving & nurturing myself, eating well & exercising, just knowing I am looking after my body & soul, I feel alive & connected. What makes me feel alive… the ocean. Wether it be sitting on the sand, eyes closed with the sun on my face, the salty wind rushing through my hair, listening to the waves crash on the shore, or immersing my body into the cool cleansing water. There is something magical about the ocean and her ability to be both soothing & electric. Gosh I loved this post so much! The oils sound divine. What makes me feel alive is…. So many things I love and am grateful for! I feel most alive when I’m running on the beach. I’m training for the London Marathon, in memory of my mum who we lost very suddenly to pancreatic cancer last year. I love the exhilaration and feeling of freedom that it gives me. WoW, what brings me alive…lots of things. It’s begin of Spring now in the Netherlands which makes me happy: more Sunlight, longer Days, buds on trees, cherry bloesems, smelly Narcissen, tulips in all bright colours. My 7-year-old-boy, who is singing out loud. Having heart-to-heart conversations with friends. Going for a long beachwalk on my own, I love the sound of waves, seagulls and seabirds. I love the sand between my toes. And I love it when I hear people sighing under my hands when I massage them, when they have that fulfillig and happy soft gaze after my loving attentionate treatment. I love it when women come into my circlegroup for training Self love, power of words, grounding etc. Such a beautiful list Julie! Thank you for sharing. I feel most alive both when I’m giggling with my little girl Indigo and when I’m in flow during a painting session. I find myself so mindful of where I am, wonder at the beauty and honour of it and just so grateful that I’m experiencing it. Even if it only lasts a few minutes. Love to read more shares of your discoveries! I have been feeling most alive since selling our home, a car, lots of our belongings, and quitting my job! Since then we have been housesitting, traveling the world, and finding resourceful ways to keep ourselves afloat. We don’t know what the future holds – but we are open to anything and we know we are able to manage any challenge. I am feeling the most alive I think I have ever felt before and I’m loving it! What makes me feel alive with this new energy of april, is to see that I hold the potential inside me to become a feminine alchemist, that I can transform all the mental diagnosis in a treasure and gold, not only for myself but for others!!! This makes me feel alive, and this alivness come with love, for the first time, I am feeling and not only understanding self love, it is the first time in my life I can look at me in the miroir and giving me a hug and be happy just because i am existing in this earth now no matter conditions or anything else!! Thank you all so very much for your beautiful comments. I loved reading through all of them and they’ve made me suddenly want to go for an ocean swim and get outdoors! The winner of the giveaway is Tracey Daaboul. Congratulations Tracey. We will be in touch via email to arrange your Sacred Self Package to be sent to you. I’m stunned and so excited! Thank you so much. This lovely news has made my weekend and put a huge smile on my face. I’m sending you my immense gratitude and love. May the angels bless you with joy and harmony today and always. Congratulations Tracey! I hope you love the package as much as I did.